What are my options here? I have two silver dollar sized spots on the front of the bumper where the clear coat has completely separated and flaked off. It leaves an unsightly halo around the spots where you can see the clear coat continuing to separate. Car washes seem to be making the spots bigger and bigger. First off, has anyone had their front bumper repainted and could tell an honest price to expect. (you can PM me). Is there something I can do, that doesnt look hideous, to at least temporarily stop the size of the spots getting bigger? Also have a spot on the driver side mirrior, on the front of it. You are likely looking at a respray. I've had a clear coat only respray done once, and it worked well,but the car was less than 2 years old and had no road rash that would telegraph through the new paint. I'd count on $500-700 for a quality job. It really depends a several factors. There's really not an attractive way to stop the flaking. I've seen folks apply the 3M clear film before, but it's not a long-term fix. Regarding the cost of repainting, if you can remove the front bumper cover yourself, you'll save a lot of money. If you just want an average fix, take it to one of the national chains. If you want a quality job, take it to a well known independent shop. Painting could range from $200 - $600 I would think, depending on the shop and quality of labor/materials. I pretty much concur with Seadweller. The cost to repaint will vary a bit, but here, its $300-$500 depending on how much prep is needed and how much you shop around. On one of my old Hondas, I feathered the clear coat back and resprayed it. It looked good from about 10 feet and was starting to peel again in about 6 months. Keep in mind that if you try to mend it yourself, you could end up making it more work for a pro to refinish later. Not much to do except a respray. Thanks for the input, consensus seems to be right around 500. Its a long shot but does anyone have any suggestions for a paint shop near Phoenix? I can remove the bumper and the little inserts myself. I've already done it before. I can sand it myself too but I think I should let a pro do it. I'm leaning towards cost effectiveness so maybe a national chain, but I'm worried they won't get the metallicness of the paint right. How good are big name places? Is it truly worth spending another 2 or 300 dollars to go to an independent shop? Last edited by kenand1988; 11-19-2015 at 06:56 PM. If you don't care what it will look like take it to.maaco. If you want it to look flawless then a top local place is where you want to go. If you take your boxster through an automatic car wash, you need to stop. If nothing else for the top which is not designed to deal with high pressure soap getting into the canvas. Hm, I'm kind of stuck then... I use a conditioner on the top to hopefully nullify going through a car wash but out here in the desert our water is really really really hard, so using a garden hose to wash the car would be terrible for the car and im not an eccentric rich guy whose gonna buy gallons of water purely to dump on my car. Last edited by kenand1988; 11-19-2015 at 09:02 PM. No self service car washes by you? The old fashioned kind with the coin and the wand? I use optimum no rinse wash. You can get it on amazon. All you need is a five gallon bucket with two gallons of water, a wash mitt and some microfiber drying towels. No hose needed. I have a hose and I don't use it because the no rinse stuff is easy and looks great. 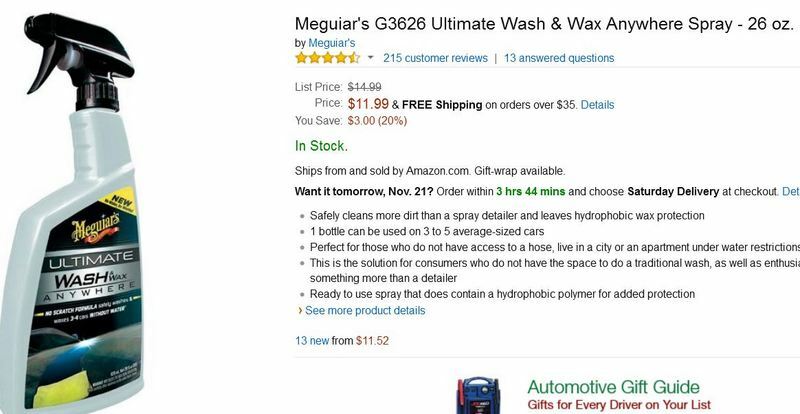 I recently started using 'Meguiar's G3626 Ultimate Wash & Wax Anywhere Spray' on my helicopter at work and am getting some for my cars. Just spray it on and wipe with a microfiber cloth. It cleans off the bugs pretty well and prevents them from sticking so much in the first place. Also helps cut down on soot build-up behind the exhaust. No water needed. I never use water from a hose on my car. I do all the cleaning in my garage where it stays and under a cover. I don't drive it in bad weather. I will clean the outside at times using my duster first over a fender, etc., then with water in a spray bottle wet a microfiber towel and wipe down the area. After that I will spray on Mother's spray wax and buff with a clean microfiber towel...The paint looks like new! I also never wet my wheels. Just wipe down and when needed, I use a small brush to do tire dressing. Normally about a hour to finish the job. The cars paint has no spider webbing! Optimum no rinse is pretty good stuff. Water alone will not provide enough lubrication between your paint and the microfibre to prevent marring the finish so its important you use some sort of waterless/rinseless wash product. Just remember to always use a clean portion of the microfibre when you're wiping. You'll probably go through several. If your car is really dirty, its always best to rinse it with water first. Be aware that auto geek forums are moderated to basically only promote shilling for the products sold by autogeek. Autogeek will remove content (e.g., delete threads) promoting products not sold by Autogeek, which compete with AutoGeek-offered products. Personally, I would recommend looking elsewhere besides autogeek for more unbiased detailing "facts" and "how to guides"... find a resource that is less biased. But back to the (very old thead!) topic at hand - yeah, Optimum no rinse is good stuff. Makes a very economical clay bar lubricant, too. Agreed. I've actually never bought anything from there. The how to guides I linked to are very useful though. Not long ago I took off the rear bumper cover of one of my cars and took it for estimates at a couple of good shops. They all said they would not do it unless they had the car to insure the paint would match. Since driving the car without the bumper/license plate is not a good idea, taking it off was a waste of time. Just give them a piece from the car that is painted, and they can still match it. For example, when I wanted the shop to paint my side skirts, I just gave them one of my painted bumperettes to use for the paint match. It came out perfect. For a rear bumper, I'd just remove the painted lid from my rear spoiler to match with. I need a front bumper and mirror respray. In the meantime - I found that replacing the mirror was cheap and easy and just bought a replacement. The mirror swap was easy and cheaper then any respray. So shop the respray of the bumper and look to Woody for a new mirror. Anyone have the clear film paint protector installed on their Boxster? My front Bumper has a few rock chips on the lower half and I am thinking about having the Lumar clear film installed now on my Hood, Lights, and side Mirrors. I would like to install it on my bumper but not before having the paint chips removed. The Lumar film is supposed to be the best, and I have heard if a rock hits the film and puts a small depression in the film, it will heal itself. Not so with other films I hear.